I'll admit right off the bat that I love Adobe software. As a professional graphic designer, I find Adobe's tools reliable and powerful. That said, however, I will also readily admit that almost all of Adobe's software has a steep learning curve. 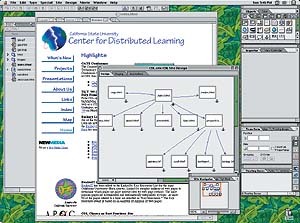 Their Web Collection (which contains Adobe Illustrator 9.0, Adobe Photoshop 6.0, Adobe LiveMotion, and Adobe GoLive 5.0) is no exception, on either count. GoLive features WYSIWYG page layout with one-pixel accuracy?the layout grid lets you place elements anywhere on the page, and they will display that way in a Web browser. You can manage your Web site with a tool that gives you a graphical map of each page, showing pages that are linked to it and including a list of graphics and other media, links, and e-mail addresses that appear in the page. You can even update your entire site at once if you change a file name, URL, or e-mail address. Once you have started a Web page or a site in GoLive, you can easily preview it as it would appear in different browsers on different platforms. (I'd recommend GoLive for this feature alone!) In addition to the source and layout views common to many WYSIWYG Web page editors, GoLive has an HTML outline view which is really useful. You can instantly see connections between related tags, such as where a table begins and ends. Photoshop was originally designed to edit high-resolution images destined for print; however, it's the tool I use most often for creating graphics for the Web such as buttons, banners, logos, and the like. By using the built-in Web-safe swatches palette, I can be sure that I'm using colors that will display properly online. There is a new "Save for Web" option which includes customizable settings for optimizing images, previously available only as a third-party plug-in. You can even create a navigational bar and "slice" it in Photoshop into individual buttons. Version 6.0 offers better vector support and a new interface as well. Illustrator is a vector-based drawing program, ideal for manipulating type and creating complex shapes. I use it for creating detailed logos, maps, and other images with a lot of type, and sometimes for Web page prototyping. With earlier versions of Illustrator, I found it easiest to create images in Illustrator and then import them into Photoshop to prepare them for the Web; however, Illustrator 9.0 offers tools to take Illustrator files directly to the Web, including the ability to save files in SWF (Flash format). Also new to this version is the option of displaying units in pixels (yay!) and a command that allows you to create shapes on one layer?for instance, with the blend tool?and instantly separate them onto individual layers. LiveMotion makes it easy to animate images for the Web. Importing Photoshop and Illustrator files is a snap. The animation timeline in LiveMotion is object-based so that each part of an image can be animated separately, even if the parts are on the same layer. Animations can be exported as GIFs or SWFs. LiveMotion also lets you create and save styles for rollovers, making it easy to create a set of similar buttons without having to repeat tedious steps. The biggest issue with the Web Collection is the learning curve. If these software programs are new to you, don't expect to be able to use any of them effectively the first time you launch them. Even if you are a longtime user of Photoshop and Illustrator, you will find that enough has changed to warrant a few peeks at the manual. When you launch any of these four programs, you're faced with a bewildering array of palettes and toolbars, and it is not immediately evident what anything d'es. You will need a manual to get started, and it will be a while before you are used to the perplexing behaviors of layers and context-sensitive tools. Another potential issue is the high-powered nature of Photoshop and Illustrator. Someone who is unfamiliar with either program is likely to be overwhelmed by the array of options available while trying to create a simple image for the Web. There is no obvious subset of tools in either application that is designed for editing Web graphics; you just have to know which of the many available tools to use and which to ignore.